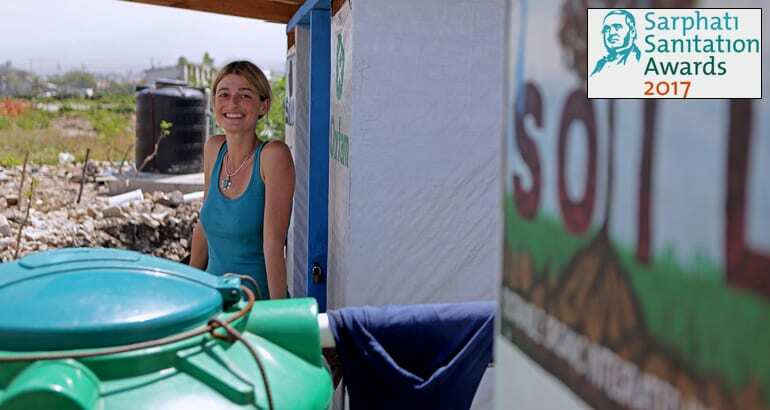 SOIL’s beloved co-founder and fearless leader, Dr. Sasha Kramer, was recently awarded the Sarphati Sanitation Award for Lifetime Achievement in recognition of her work to develop sustainable sanitation solutions. Congratulations to Sasha, and thank you for your years of service! The award is named after Dr. Samuel Sarphati, a doctor who made significant contributions to ridding the City of Amsterdam of cholera in the late nineteenth century. We’re deeply honored to receive this recognition of Sasha’s work and of the model SOIL is building in Haiti. In fact, here’s a special message to say thank you! 4 Replies to "SOIL's Dr. Sasha Kramer Wins the Sarphati Sanitation Award for Lifetime Achievement"
Soil’s Dr. Kramer, and all of you who work at Soil in Haiti, deserve worlds of praise for what you are doing for the people of Haiti and for the cause of clean sanitation for all the world. Congratulations, and thank you. On behalf of Sasha and the rest of the SOIL team, thanks for reading the blog and for your kind words, Rene! Sure do! This is a wonderful acknowledgement of Sasha’s work. Sasha and her team are exceptional and much appreciated by meany. Hi Sr. Mary, I’ll be sure to pass along your note to Sasha. On behalf of the rest of us at SOIL – thank you!